Here are some good impromptu speech topics to help speakers prepare for the day when asked to give a speech "off the cuff." Presenters may also like to check out my tips for delivering this type of speech, as giving an impromptu speech is more challenging than providing a presentation with lots of time to prepare. 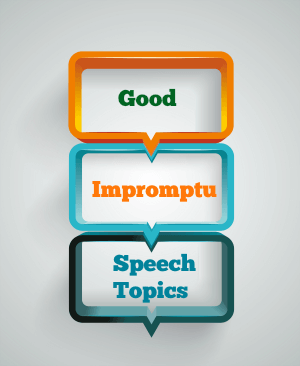 And do remember that - like other speeches - an excellent impromptu speech will have an opening, body, and conclusion. Given the fact that most of the audience remember the opening and closing segments more than the rest of the speech, try to ensure that those parts are as good as they possibly can be! What moral issue best defines you? What is the most significant effect of the internet? Discuss the most memorable event in your life. Is capitalism the best political and economic system? Defend your choice. Is knowledge more important than wisdom? Is a glass half full or half empty? Explain your choice. Why are humans so fascinated with understanding the universe? Does technology live up to its promise? Ghosts I'd like to meet. Final 10 Good Impromptu Speech Topics! The greatest gift we can give others is? Come on back when you need more ideas for your impromptu speeches - and don't forget to 'Like' the Best Speech Topics Facebook page to see lots more tips, topics, and speech-related information right in your news feed!